Most 3D printers build objects by extruding a molten material, by partially solidifying a vat of liquid, or by selectively adhering granules of powder. But right at the bleeding edge of current 3D printing developments, specialist “bioprinters” are starting to create living tissue by outputting layer upon layer of living cells. While several research teams and organizations are working to make bioprinting a reality, one consistently appears to be at the head of the pack. This market leader is Organovo Holdings, Inc. headquartered in San Diego, California. The company was initially set up by a research group lead by Professor Gabor Forgacs from the University of Missouri, and was recently listed in the MIT Technology Review’s 2012 TR50 List of the World’s Most Innovative Companies. It has also just raised an additional $15.2 million of funding to further its research. There are in essence two ways to bioprint living tissue. One jets single cells into a supportive hydrogel, while the other outputs “bioink spheroids” containing an aggregate of cells. This second approach is taken by Organovo, can reap faster results, and is kinder on the cells. 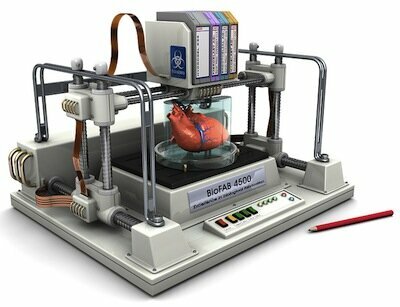 Organovo has developed a commercial bioprinter called the Novogen MMX. The company cultures cells from a potential patient, extrudes them into a very thin “bioink sausage”, and then uses a special cutter to chop them up into tiny pieces that form into bioink spheriods containing up to 80,000 cells. The Novogen MMX’s print head next places these spheroids into a “biopaper” hydrogel to form the first layer of an object, such as a blood vessel. Another layer of supportive biopaper and bioink spheroids is then added, and then another. Once the object has been full printed the biopaper support material slowly dissolves away. More remarkably, the bioink spheroids fuse together into living tissue, with the cells contained in their aggregate rearranging themselves. For example, when printing a blood vessel, the endothelial cells migrate to the inside, the smooth muscle cells move to the middle, and the fibroblasts migrate to the outside. The stages of bioprinting. Photo Credit: ExplainingTheFuture.com. When you 3D printing something in plastic or metal it will not “evolve” after printout. Yet when cells are bioprinted under the right conditions, nature offers a helping hand. This process as pioneered by Organovo may appear almost magical. But it is no more so than the cells in an embryo knowing how to arrange themselves into a new human being as they grow. The post-printout rearrangement of cells is also potentially extremely useful. For example, it means that when bioprinting a kidney it will not be necessary to bioprint all of its intricate capillaries, as these will form “naturally” after the initial 3D printing process. Back in 2008 Organovo used an experimental bioprinter to output functional blood vessels and cardiac tissue using cells obtained from a chicken. By December 2010 Professor Forgacs and his team had created the Novogen MMX and used it to bioprint blood vessels using cells cultured from a human being. With bioprinted nerve grafts having already been implanted into rats, Organovo anticipates human trials of bioprinted tissues as early as 2015. Before this time, the company expects its first clients to be medical researchers who will be able to test drugs on bioprinted organs produced by the Novogen MMX. Within a decade or two, Organovo and other bioprinting pioneers anticipate the development of a wide range of tissue-on-demand and organs-on-demand 3D printing technologies. These could drastically reduce organ donor waiting lists and so improve the quality of life of many individuals. A great deal of research still needs to take place in order to produce viable living tissue for transplantation. Yet with the 3D printing industry now seriously starting to take off, it is a fair bet that its bioprinting twin could become an equally transformative technology sometime next decade. Christopher Barnatt is a futurist, videographer, and Associate Professor of Computing & Future Studies in Nottingham University Business School. His ninth book -- 3D Printing: The Next Industrial Revolution -- was published in May 2013.